When I woke up between 2 and 3 am on Saturday morning after going to bed at 8 pm on Friday night, I came across a fresh review by the New York Times of Sayville's Bistro 25 on Twitter. Joanne Starkey of the Times called Bistro 25 "a welcome, affordable discovery," and noted many dishes including a pork belly appetizer, items from a special Oktoberfest menu, and braised short ribs. The possibility of these three delicious dishes had me convinced that 25 would be a good place to try, but it was a hard sell on my roommates (Denise and Ed) until Olga said she wanted to go too. I called up on Sunday to get a reservation for that night, and was not surprised to hear that the restaurant was practically booked up after the Times obsessed over it. Beginning of the end? Just kidding. The friendly host (and owner) squeezed our party of five in for 4 pm with the understanding that we would be out by the next reservation at 6. We arrived to find the bar full and loud, a live band setting up, and our table right next to a large christening party complete with several rambunctious little bundles of love. It took me about 25 minutes to decide what I would have off of the extensive but refined menu. 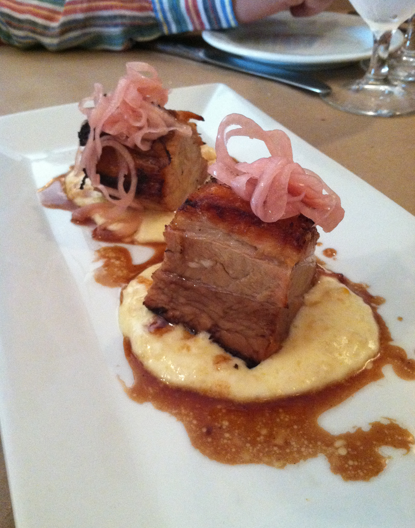 I wanted to choose different dishes than were reviewed in the Times, but the pork belly appetizer was irresistible. This whole process involved me begging others to order dishes that I wanted to try including the pate app and the braised short ribs. 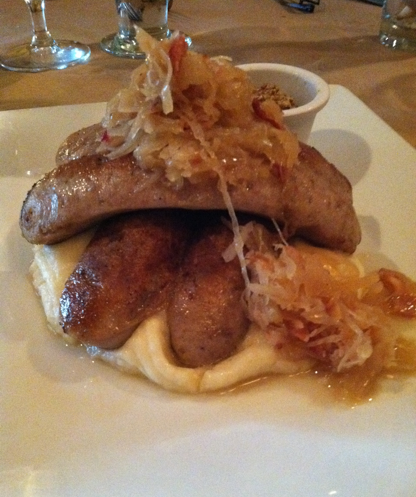 When we finally ordered, we all changed our minds again and most of us ended up getting the prix fixe Oktoberfest menu. We ordered the pork belly and mac and cheese apps for the table, and I ended up with a potato soup and the bratwurst main. Mom and Olga went with the pork shank and spaetzle, Rich with the paella, and Ed with the sauerbraten. The Braised Pork Belly appetizer with corn pudding and pickled shallots was more meaty and less fatty than I expected, but very tasty and satisfying. The tops of the cubes were crisp and the meat was well complimented by the sweet corn and shallots. I enjoyed the mixture of textures. The Truffled Macaroni & Cheese was made with smoked gouda, cheddar and parmigiana. The truffle inclusion made it a winner for me but I could have done without the smokiness of the gouda; I am not a smoked cheese lover but I wouldn't go so far as to say it ruined the dish. Mac and cheese plus truffle oil is an upgrade that helps me justify my love for this possibly juvenile dish. It says, yes, I still have the taste of a small child, but with the price-tag-sophistication of a steak. I ain't no cheap date. The breadcrumb topping was nice and the dish was creamy but light. I got the Bratwurst because I peeped the man at the next table devouring it. I have no complaints about the dish. The brats were cooked well and the mash was creamy. I am really enjoying my newfound affinity for sauerkraut, so I was happy to see it here. The pork shank and spaetzle dish was another winner. The shank was tender and covered in dark gravy, and the spaetzle were light. The sauerbraten was nice and tender too, but the accompanying potato balls were too light and could almost pass as mashed potatoes. They needed to be more starchy and sticky. The meat had the familiar pickled taste that reminds me of family get-togethers in the Fall. We often find ourselves disappointed in German food in restaurants, but we were all refreshed to find this meal delicious. All of the dishes had nice presentation, and the breadsticks on the table were tasty and warm. 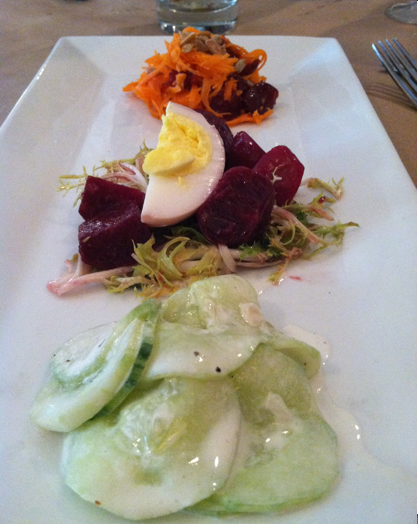 The menu features 25 bottles of wine at or under $25, hence the name Bistro 25. All of these factors plus a reasonable price tag made this experience one that I would repeat. I hope that next time there won't be a large party in the vicinity of my table or a time limit (which was enforced by 6:05.) The friendly atmosphere and tasty food won my approval and will probably lure me back in the future.